The National Weather Service has warned that dangerously cold weather will hit the St. Louis region Tuesday and stick around through Thursday. The wind chill could reach as low as minus 40 degrees and could cause frostbite in just 10 minutes, according to the warning. It’s important to plan ahead for severe weather to prevent cold-related maladies like frostbite and hypothermia, said Washington University School of Medicine professor of emergency medicine Gary Gaddis. Weather will be cold enough on Wednesday that people should take extra precautions, Gaddis said. He recommends keeping blankets, warm clothes, candles and matches in your car, in case you get in an accident and have to wait for help in the cold. He also recommends keeping your gas tank at least half full. “The best treatment for frostbite is just like the best treatment for a lot of things: it’s prevention,” Gaddis said. Signs of frostbite include pale fingers, noses and ears. Less severe frostbite starts with pain; more severe frostbite can cause blisters and requires more in-depth treatment, Gaddis said. Shivering can signal that someone is getting dangerously cold. But people could be warm enough to prevent shivering while still leaving their extremities uncovered and at risk of being frostbitten. If you show signs of frostbite, Gaddis recommends running warm — not hot — water over your hands and staying inside. Research shows that warming up then cooling off multiple times can make injuries worse, according to Gaddis. Above all, if you have pain that doesn’t go away, or blisters on your extremities, contact a doctor. “The most vulnerable people to frostbite are people who have to be outside for a long time,” said Gaddis. People experiencing homelessness are especially at risk, because they often sleep outside. Gaddis said that when temperatures get this low, sometimes people experiencing homeless seek shelter in Barnes-Jewish’s emergency department. “Most people who have a home are unlikely to come in when it’s really cold because most people manage to stay inside,” he said. The City of St. Louis is providing its standard homelessness services during this cold snap, including providing two warming buses in downtown. Volunteers are extending their hours and working to find additional shelters, according to St. Louis’ human services department. 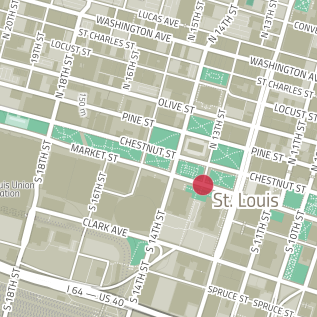 Anyone who needs shelter can go to N. 13th and Market streets in downtown St. Louis. Anyone who needs shelter should go downtown to the corner of N. 13th St. and Market streets to be transported to somewhere warm. Agustin said that St. Louisans should keep an eye out for others who might need medical attention and, if someone might need help, call 911 directly instead of United Way. The county’s human services department will also work to drive homeless individuals to shelters. “The last thing we want to do is [for] anyone to be without shelter generally speaking, but especially during these extreme temperatures,” said Yusef Scoggin, director of the department. If you or someone you know needs shelter in the city or county, call the St. Louis Housing Helpline at 314-802-5444. Or, call United Way at 211. Scoggin, the county’s director of human services, says that anyone who needs shelter can reach him directly at 314-267-0346. St. Louis agencies and community organizations that work with the region’s homeless population are calling on city and county residents to volunteer time and donate supplies. The groups are stretching resources to keep people warm and fed as weekend forecasts warn of more sleet, snow and freezing temperatures. The Freedom Center of Missouri has filed a federal lawsuit against the City of St. Louis over local regulations that prevent people from providing home-cooked meals to the homeless. The suit alleges that the city policy violates the constitutional right to freely exercise religion, because it prevents people from following religious mandates to help others. The city of St. Louis plans to add more beds to its Biddle homeless shelter, north of downtown, starting on Monday. The shelter currently has room for 100 men to stay overnight. Mayor Lyda Krewson announced Thursday that Biddle House will make space for an additional 50 men until the end of March. A residence in the Central West End has had the reputation of catering to poor and low-income women for years. But now, the organization's work to house middle-aged and elderly women with mental illnesses and, in some cases, formerly homeless women, is vital in a city seeking to address its issues around homelessness. The Mary Ryder Home, 4361 Olive St., isn’t a nursing home or an independent senior-living facility. It gives women over age 55 who can no longer afford to live on their own — either because of mental health issues or financial problems — a place to stay. Permanently.